After falling gently across the board yesterday as traders cashed in their profits and exited the market, markets are trending slightly higher today. Crude prices gave up 17 cents (0.3%) yesterday, but have since recouped those small losses to regain their level above $52. Prices this morning are $52.24, a gain of 34 cents (0.7%). Refined products also fell yesterday, though losses were asymmetrical. Gasoline felt some support from higher RINs prices, while diesel prices fell steadily lower throughout the day. Diesel prices fell 2.3 cents (1.3%) yesterday, from over $1.81 to $1.7878. Prices have yet to surpass the $1.80 level again, but given recent trading ranges it looks likely they’ll eventually make their way back up to it. Diesel prices are $1.7957 currently, gaining .79 cents (0.4%) since yesterday’s close. Gasoline prices saw only slight losses yesterday, giving up half a cent (0.3%) to reach $1.6783. Prices are stronger this morning, with prices gaining $1.2 cents (0.7%) to reach $1.6907. As noted above, rising RINs prices have been helping to boost gasoline prices. As we’ve discussed before, refineries must buy RINs for every gallon of gasoline produced, so higher RINs prices mean more cost going into each gallon of gasoline. RINs prices have seen support over the last week, courtesy of EPA Administrator Scott Pruitt. A couple weeks ago, the EPA announced they were considering reducing 2018 and 2019 renewable volume obligations, sending RINs prices lower since a lower obligation means refineries needed fewer RINs per gallon of fuel, thus reducing demand for RINs. On Friday, Pruitt wrote to some Senators that the EPA would not be reducing volume obligations, which has given RINs markets renews strength. Renewable markets in general have been shaky since Trump was elected and appointed Scott Pruitt, known for his ties to fossil fuel companies, to the EPA. The letter helps provide comfort to markets that renewables will not be radically changed in the near future. API data will be released this afternoon. 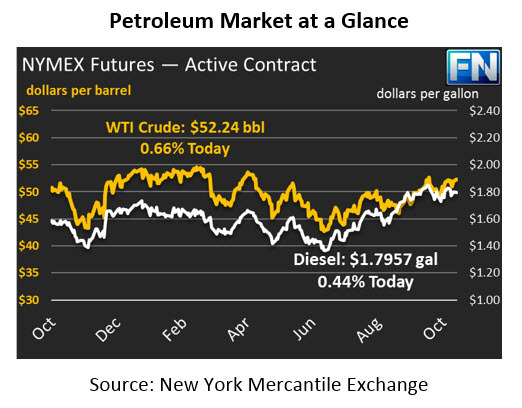 Markets are expecting an overall draw across crude and refined products, which would give markets some renewed strength. Stock levels have generally trended downwards lately, after some skewed numbers in September following Harvey and Irma. As OPEC cuts continue to take hold, inventories world-wide have been drawn lower. Previous ArticleCalifornia Fuel Tax Hike – Are You Prepared?